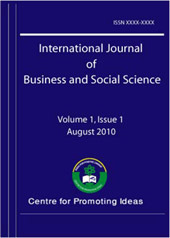 International Journal of Business and Social Science (IJBSS) is a monthly peer reviewed journal published by Center for Promoting Ideas (CPI). IJBSSpublishes original papers, review papers, conceptual framework, analytical and simulation models, case studies, empirical research, technical notes, and book reviews. IJBSS is inviting papers for the upcoming issue of the journal.